After his first solo album (1972's Henry the Human Fly) was a commercial disaster, former Fairport Convention guitar virtuoso, Richard Thompson, set out to record his second album with new wife Linda. 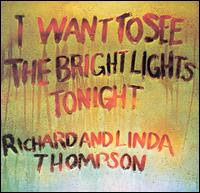 The resulting collection of songs, I Want to See the Bright Lights Tonight, is 70's folk tinged rock at its finest. The Thompsons share vocal duties throughout the album, taking turns singing Richard's bleak character studies. The title track offers a rare light-hearted lyrical moment as Linda sings the joys of weekend escapism. Put this one on loud for Saturday night. This blog is intended to share music that we are passionate about. All mp3's are for sampling purposes. If you like it, buy it. Please contact us with any complaints about posted files and we will promptly remove them.